Collar 14 1/2" 15" 15 1/2" 15 3/4" 16" 16 1/2" 17" 17 1/2" 18" 19"
Extra Short Sleeve Length 32 1/2" 32 1/2" 33" 33 1/2" 33 1/2" 34" 34 1/2" 34 1/2"
Short Sleeve Length 33 1/2" 33 1/2" 34" 34 1/2" 34 1/2" 35" 35 1/2" 35 1/2"
Standard Sleeve Length 34 1/2" 34 1/2" 35" 35 1/2" 35 1/2" 36" 36 1/2" 36 1/2"
Long Sleeve Length 35 1/2" 35 1/2" 36" 36 1/2" 36 1/2" 37" 37 1/2" 37 1/2"
Extra Long Sleeve Length 36 1/2" 36 1/2" 37" 37 1/2" 37 1/2" 38" 38 1/2" 38 1/2"
Body Length Short 28 1/4" 28 3/4" 29 1/4" 29 3/4" 30 1/4" 31 3/4" 31 3/4" 31 3/4"
Body Length Regular 29 1/4" 29 3/4" 30 1/4" 30 3/4" 31 1/4" 31 3/4" 32 3/4" 32 3/4"
Body Length Long 30 1/4" 30 3/4" 31 1/4" 31 3/4" 32 1/4" 32 3/4" 33 3/4" 33 3/4"
Collar 14 1/2" 15" 15 1/2" 15 3/4" 16" 16 1/2" 17" 17 1/2"
Extra Short Sleeve Length 32 3/8" 32 3/8" 32 3/4" 32 7/8" 33 1/4" 33 3/8" 33 3/4" 33 7/8"
Short Sleeve Length 33 3/8" 33 3/8" 33 3/4" 33 7/8" 34 1/4" 34 3/8" 34 3/4" 34 7/8"
Standard Sleeve Length 34 3/8" 34 3/8" 34 3/4" 34 7/8" 35 1/4" 35 3/8" 35 3/4" 35 7/8"
Long Sleeve Length 35 3/8" 35 3/8" 35 3/4" 35 7/8" 36 1/4" 36 3/8" 36 3/4" 36 7/8"
Extra Long Sleeve Length 36 3/8" 36 3/8" 36 3/4" 36 7/8" 37 1/4" 37 3/8" 37 3/4" 37 7/8"
Body Length Short 27 1/8" 27 1/2" 27 7/8" 29 5/8" 29" 29 3/8" 29 3/4" 30 1/8"
Body Length Regular 28 1/8" 28 1/2" 28 7/8" 29 5/8" 30" 30 3/8" 30 3/4" 31 1/8"
Body Length Long 29 1/8" 29 1/2" 29 7/8" 30 5/8" 31" 31 3/8" 31 3/4" 32 1/8"
Please see below for approximate location of your monogram. Collar 14 1/2" 15" 15 1/2" 16" 16 1/2" 17" 17 1/2" 18"
Chest 40 1/2" 42 1/4" 44" 46" 48" 49 3/4" 51 3/4" 53 1/2"
Waist 34 1/2" 36 1/4" 38 1/2" 40 1/2" 42 1/2"" 44 3/4" 46 3/4" 49"
Hip 37 3/4" 39 1/2" 41 1/2" 43 1/2" 45 3/4" 47 1/2" 49 1/2" 51 1/4"
Sleeve Length 34 1/2" 34 1/2" 35" 35 1/2" 36" 36 1/4" 36 1/2" 36 1/2"
Collar 14 1/2" 15" 15 1/2" 16" 16 1/2" 17" 17 1/2" 18" 19"
Regular Fit Standard Length 34 1/2" 34 1/2" 35" 35 1/2" 36" 36 1/2" 36 1/2" 36 1/2" 36 1/2"
Tailored Fit Standard Length 34 1/2" 34 1/2" 35" 35 1/2" 36" 36 1/4" 36 1/2" 36 1/2" 37"
Regular in fit which allows for movement - ideal for busy gentlemen who need to look smart on the go. ored in silhouette than our Classic, it provides a close and concise fit without the use of shirt darts. - 2.0"	 - 1.5"	 - 1.0"	 - 0.5"	 Standard Length	 + 0.5"	 + 1.0"	 + 1.5"	 + 2.0"
A deep point, subtle spread and iconic curve makes our signature collar unique. A less extreme version of the cutaway collar, the Regent offers a medium spread and higher stance. A refined version of the International button down, the points of the collar are fastened by mother-of-pearl buttons. Based on the Dr. No collar, but with less curve and a slightly lighter, relaxed lining. The POW collar shape sits between our Classic T&A and Regent collar, providing an elegant look. The signature cuff uses three mother-of-pearl buttons sewn one inch apart for a precise and unique finish. Also known as the french cuff, it is the ideal choice for those with a penchant for cufflinks. Made famous by 007, the cocktail cuff (also known as turnback) brings together the elegance of a double cuff, and convenience of a button cuff. Soft on the eye, the rounded cuff provides a clean and simple look, complete with a mother-of-pearl button. The squared cuff provides a clean and refined look, complete with two mother-of-pearl buttons. Go for a buttonless gauntlet to provide added flair. Add a button on the gauntlet (sleeve placket) to provide a tapered look. A popular placket style which is quite literally raised, it's strong, versatile and works perfectly for every day wear. 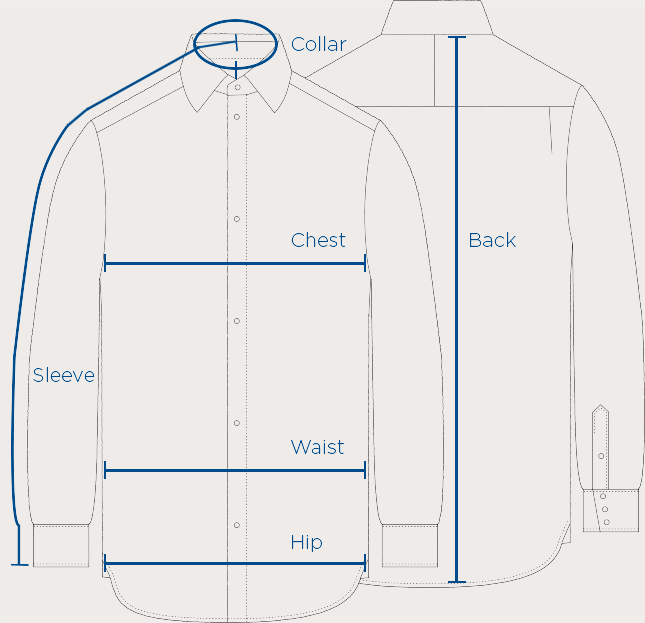 A popular placket with no fold back, it works well for both business or casual occasions. Ideal for dress shirts, the fly placket keeps all buttons with exception of the top concealed. After the shirt is added to shopping bag, you can’t edit it anymore.